Late last week JD and I made the quick trip up to Boston for a couple of days. He took a course in Salem and I spent my time wandering around solo. I had chocolate chip pancakes for lunch at The Paramount, strolled through the Public Garden in the snow, and did some (window) shopping on Newbury. It was perfect. This is the one and only outfit we shot while there - it was just too cold (and very windy). Layers were key. For our drive up and first afternoon in town I wore a simple chambray shirt with a gray sweater on top with black pants, and impractical boots. I have been wearing my sorels so much lately, I needed a break. 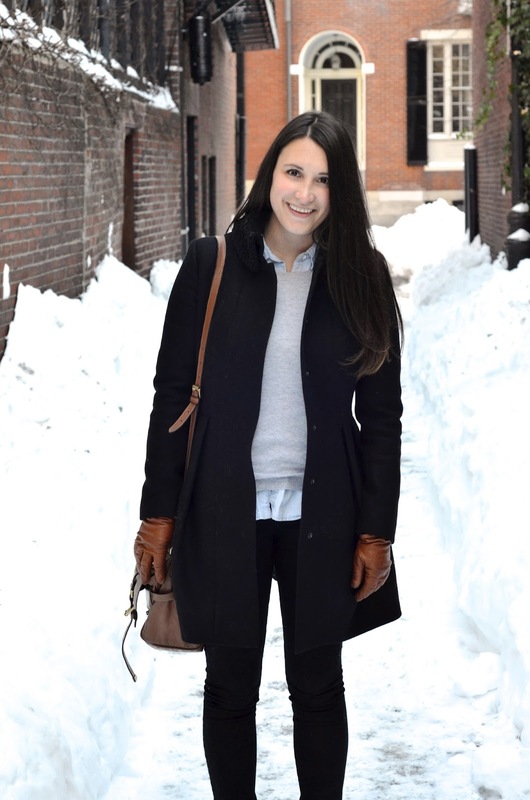 The ice topped brick sidewalks of Beacon Hill were clearly the ideal place to do so. I managed to maintain my balance but ended up back in snow boots when we went back out for dinner later that evening. And now a special treat, I am teaming up with Heidi, Rach, and some other lovely ladies for a $340 cash giveaway! The giveaway begins today and runs until Sunday, February 8 at 11:59pm. Good luck and happy Monday! What a great winter look! I love your layers! Oh my gosh that is so much snow! You look lovely and somehow don't look cold at all! Wow that's an adorable look for that blanket of snow!!! 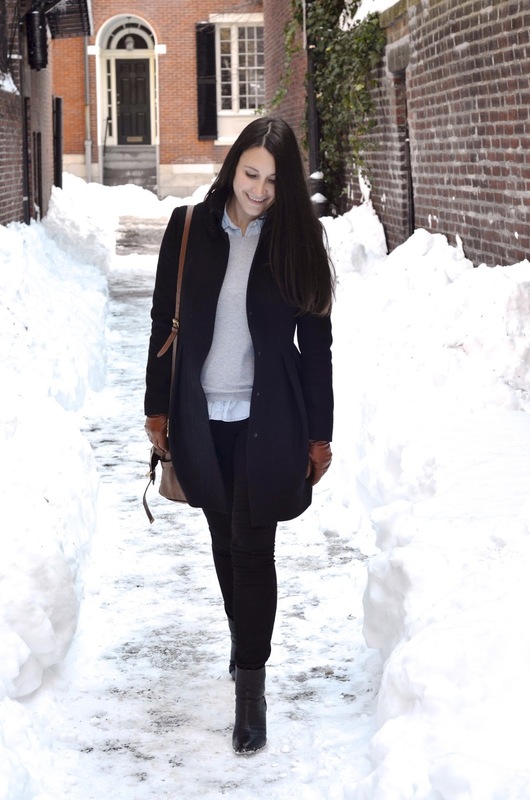 This outfit is perfect for a solo stroll around Boston - brilliantly fresh and preppy! 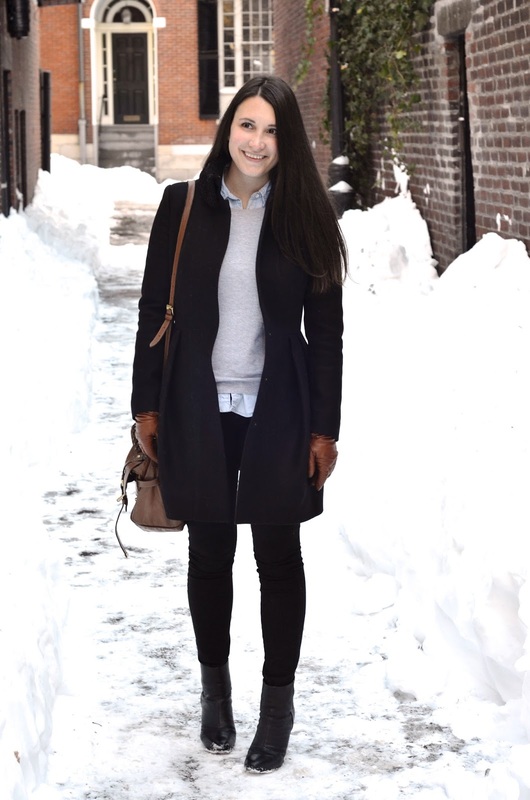 You braved the cold weather to share this look with us. Thank you. You look adorable and not one bit cold. OMG that is a LOT of snow girl! I can't believe you were walking around Boston in that! I think I'd be staying inside haha! I'm such a FL girl. It looks really pretty though and you look amazing! Oh my word that snow! Unreal! And your hair. Absolutely perfect. You are seriously channeling modern day snow white. Stunning! I love the layers in this outfit! I've never experienced this much snow in my life (as you currently have in Boston) I would love to live it one winter! Hope you stayed warm on your jaunt around town! Loving this look, especially those booties! It looks so cold but your layers will keep you warm! Wow....that's a lot of snow! 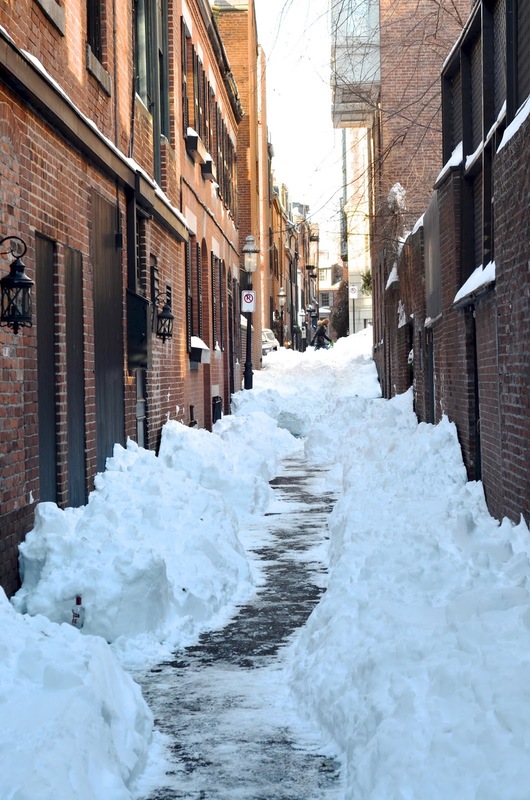 I think after our recent storm in Toronto, our streets will be looking like that too. All that snow -- I would've ran in the opposite direction! I hope you had fun, despite it all. That coat is a classic beauty on you. I love navy! Your outfit is so appropriate for Boston, it's like school girl chic. Also jealous of your chocolate chip pancakes! Love those booties! Hope you're staying warm in this extra chilly weather! Xo.